In this article, we will explore what technologies are used in microlearning, how a mobile-enabled microlearning digital platform helped an organization deliver continual training, and some crucial dos and don’ts of microlearning development. Video is the most important medium to deliver content in today’s era. It is a great learning platform used to present content in a format which learners mostly prefer. Also, it is a fact that our brain process videos faster than normal text, thus reducing the content’s cognitive load. Modern learners ﬁnd videos more engaging overall because it requires less cognitive strain. As a learner, if you are given the choice between reading a document and watching a video, you will choose the video! Isn’t it? Microlearning is an excellent way to learn on mobile. Several smartphone users have shared their experience saying that they are always in a hurry when searching for something on their devices and they abandon a website or app which opens too slow. Mobile devices are perfect to access micro content, as learners are able to interact with small pieces of content on the ﬂy. Search on demand Learning and Development lacks behind on search capability and majority of people are looking for new learning solutions. The bite-size modules in microlearning are easy to search and immediately applicable to meet learning requirements at the point of need. Our client is an organization which develops and delivers high-quality professional training solutions for a varied array of clients. For more than 30 years, they have been dedicated to the creation of impactful and innovative training, by mingling modern educational tools and newer technologies to help new-age learners realize their educational and professional goals. G-Cube developed a mobile-enabled microlearning digital platform for continual training delivery and re-enforcement. While ﬁrmly believing in the strength of Instructor-Led Training to make a meaningful experience for learners, the client realized the need for sustained learner support that extends beyond the conﬁnes of a classroom. Continuing re-enforcements in the classroom format had logistical barriers which made it a cost and me-prohibitive proposition. 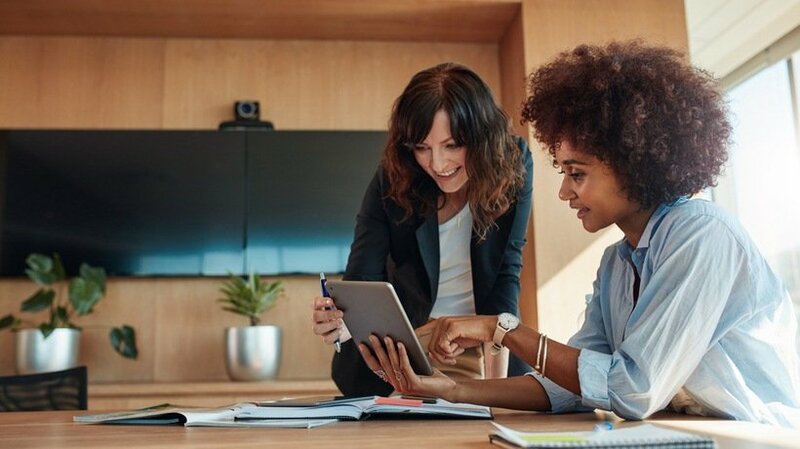 Today’s tech-savvy professionals needed a flexible learning platform to provide them with the necessary learning support and multiple learning opportunities anywhere, anytime, and on any device they choose. The delivery of content on the platform’s learner interface is designed on the concept of the Windows 8 tile-based interface. This provides a visually attractive and intuitive layout design, which is graphically enhanced and user friendly. The tile interface also kept the UI design clutter-free, allowing learner-ease with the system. The platform has fifteen tiles in all, with 6 main tiles including the Classroom, eBook, Collaborate, Twitter, Videos, and Checklist. Highlight of the platform was a Video library, oﬀering an array of short instructional videos for instant support. Availability of the short learning videos on this platform helps the learner derive more out of the learning experience. Keeping the videos short and light, it is made sure that they render well on the mobile platform – creating a strong audio-visual connect with the learner. Enabling the student with tools to succeed post-class, the platform increases learning retention while decreasing the need for class re-takes, overall improving training ROI. The experience of learning as a whole has been both enriched and enhanced. Learners are more enthusiastic to engage in a technology-enabled solution – which saves them time and eﬀort all the while imparting practical learning for their beneﬁt. Think about your audience and their preferred ways of learning before choosing microlearning. Do consider factors like readiness with the format or access to resources like mobile devices or internet access. Interactive elements help to grab more attention of learners, reducing the me to learn and improving learners’ engagement. Microlearning courses should be visually appealing with the inclusion of graphics and multimedia. Focus on keeping it short. Microlearning will lose relevance if the learning content runs too long – it has to be short and crisp. Chunking longer content into shorter modules is the way to go ahead. Short assessments like quizzes or multiple choice questions can be utilized to assess the understanding of learners and check if they are able to apply the learning in a fruitful manner. These short assessments are also a way to check the success of the chosen medium of microlearning. A gamiﬁed environment on microlearning through points, badges or even leaderboards can increase learner engagement a lot. Do not add too much information. You should include only relevant content which the learner needs to know. For instance: Adding extraneous information in a compliance training where the content is already dense makes the course heavier and difficult to understand. Do not use irrelevant multimedia. Adding images and videos just for the sake of ﬁlling space is not a good decision. These should be linked with the content in a way that learners are able to understand the course beer and quicker. Do not be too formal. When it is about self-paced courses, formal language should not be used. Using a conversational and direct tone creates beer learning experience for the learner. Do not skip on production quality. Just because it is short, doesn’t mean that it requires no work at all! Modern learners have come to expect a certain level of quality with all content – including the learning content that they access. Visual appeal goes a long way and it would not be wise to de-prioritize it to save some bucks. Do not utilize microlearning as a stand-alone learning activity. As well-illustrated in the live case-study shared in the previous section, microlearning is a fantastic tool as a learning refresher. But having said that, it is often not enough to just provide concise information. When learners have to grasp complex topics, detailed eCourses or classroom sessions have to be utilized – and microlearning effectively creates a sustainable platform of learning re-enforcements for the same. Do you wish to increase the completion rates of your eLearning courses? Are you looking for ways to improve the retention level of your employees at workplace? If yes, then you need to adopt microlearning. With the evolution of modern learning styles, microlearning has become the latest trend in the realm of eLearning. With this approach, you can break down a speciﬁc subject content into bite-sized modules, giving the flexibility to learners to learn at their own pace and in order of their choice. Microlearning has immense potential to serve mobile learners globally, because chunked or micro content can be accessed anywhere and from any device. It has gained popularity in recent years, primarily because of two factors – technology platform that enables tracking of micro content and on the other side, content creation made easy, and understandable with videos. 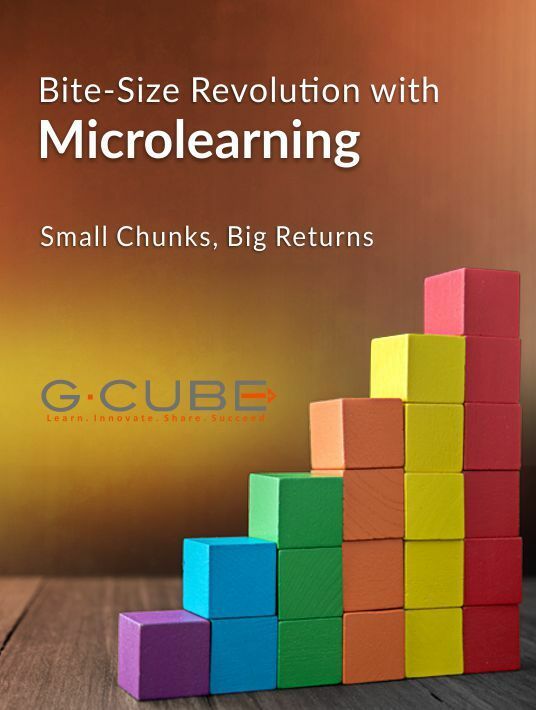 If you want to learn more, download the free eBook Bite-Size Revolution With Microlearning - Small Chunks, Big Returns.